A group of nurses entered the unmarked room before getting locked inside it themselves. The mystery patient inside had drawn their attention, and upon further investigation, they realize this may be a cover-up for a botched surgery. At least, that was the setting outlined for teens as they walked into the Sitka Campus Nursing Lab on February 8. Staff from the Student Success Center (SSC) had transformed the lab into an escape room, with a series of puzzles and riddles that participants had to solve before they could “escape” the room. 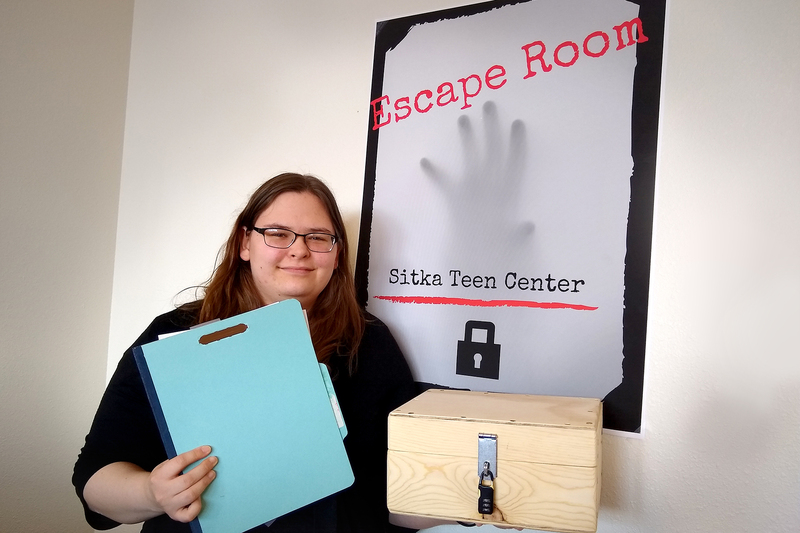 Put on by the SSC to advocate for a teen center, the attraction welcomed 97 local teens, who then worked their way through at least one of two escape room scenarios. The second was located in the SSC; the scenario focused on a professor who went missing while conducting a research project in the forest. “[The event] was to help support the idea that there should be a place for teens to hang out that’s friendly and safe,” said event co-organizer Gabriella Barile. Alongside the two escape rooms, Barile and the SSC team also hosted karaoke, people bingo, and other ice-breaking games for students to partake in while they waited. “I was really pleased with the turnout,” Barile said. “We ended up having to add a few more sessions to get kids through,” she added, explaining that each group of participants was given only 15 minutes to work through a scenario. SSC staff and co-organizer Jeanette Farah-Bucher said she most enjoyed hearing the attendees sing karaoke together. Barile had a different take. “What was really cool was watching how different groups solved it. In some groups, there was a clear leader,” said Barile. She explained that one girl had encouraged introductions among team members before starting the puzzle, which ultimately aided their collaboration and listening. “Other groups were a little bit more of a free for all… there was no communication,” she said. Barile said her inspiration stemmed from both her work at the Express Care Clinic in town, and the university setting. She even made medical charts with help from Searhc Nurse Practitioner Jackie Bolmer that accurately depicted symptoms of the malpractice case.